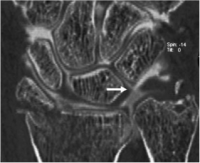 IV Osteoarthrotic Complete tears of the LT ligament and other extrinsic ligaments, which results in signs of articular degeneration in the midcarpal joint. Complaints related to LTD are generally a combination of ulnar sided wrist pain that is worsened by power gripping and a movement-dependent click phenomenon. 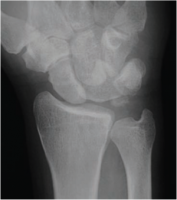 Clinically there is tenderness over the lunotriquetral joint and an increased mobility of the triquetrum in relation to the lunate. Fig 4. (A) PA radiograph and (B) lateral radiograph of LT dissociation. We must consider several factors when deciding on the optimal treatment plan for a patient with LTD. Stage of instability, time elapsed since injury, associated injuries and demands of the patient will all affect treatment choice. ↑ Doyle, J.R. (2006). Hand and wrist. Philadelphia: Lippincott Williams & Wilkins. (169-174).